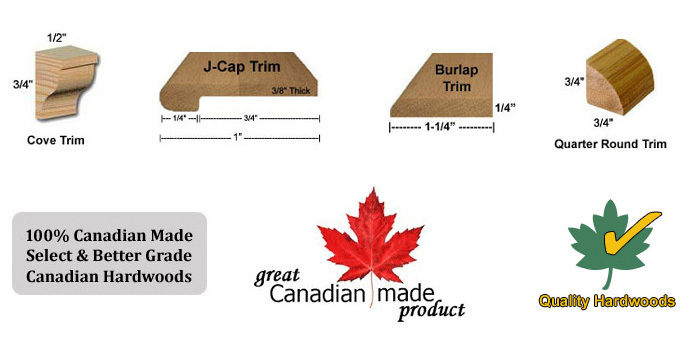 Buy Solid Hardwood Stair Trims Direct Online At Discount Prices - We Ship Canada Wide. Prefinished Stair Trims Done In Our Spray Booth Or Unfinished If You Wish To Complete This Task. We stock a full product line of hardwood stair trims and mouldings to meet your job site needs. We carry all our stair trims and mouldings in the three main hardwood types: birch, oak, and maple. We also manufature custom stair trims and mouldings in many special order exotic wood types, as we own a custom millwork shop. We can make: jatoba, walnut, white oak, etc ( note: custom hardwood stair trims and mouldings many only be available on a volume basis or within a staircase package sale ).